Recipes prepared in my little kitchen. Some are my own, some passed on by my mom, some by friends, some that friends like on facebook when made by someone else. Some from websites and some browsing through websites.. Treat yourself to these amazingly tasty and healthy treats. These are totally guilt free and you will love them.I tried these popsicles the same day I came across the recipe. The pictures have been waiting for a long time in my camera waiting for me to blog the recipe. I finally decided to write the recipe today. These are so delicious that you will want more than one, at least I did. I had ripe bananas and blueberries handy but you can make with other fruits and berries of choice. It doesn't take much effort either. 1. Peel the bananas and blend them to a smooth puree using a food processor or a hand mixer or any desired appliance. 2. 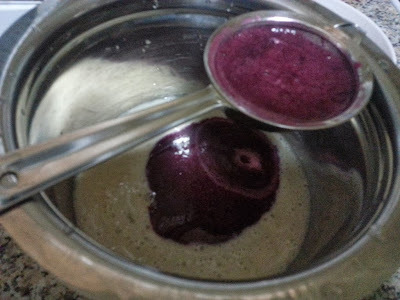 Add yogurt, sugar and lemon juice and blend to combine. 3. 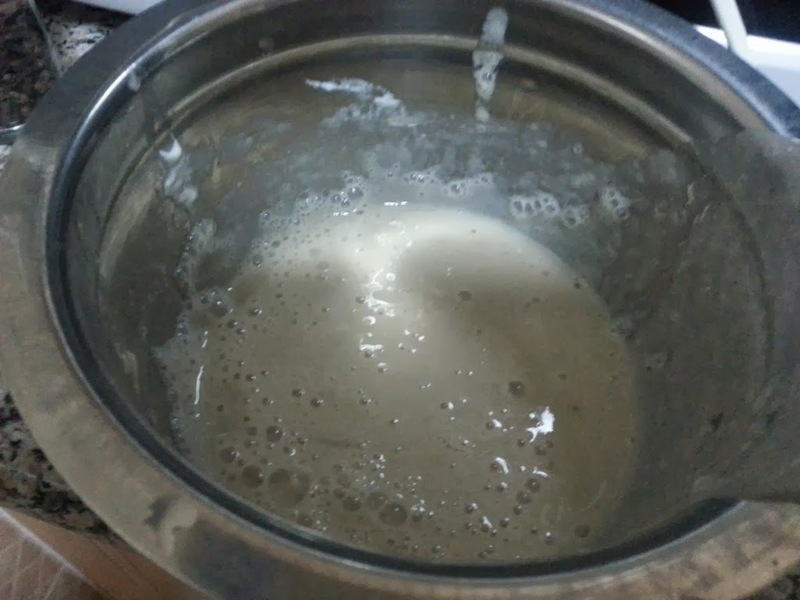 Divide the banana yogurt mixture into half. Keep one half aside. 4. Add blueberry juice to the other half of the yogurt mixer and blend to combine. 5. 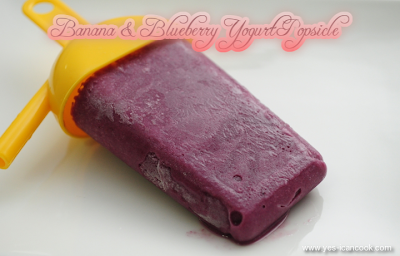 Pour blueberry or banana yogurt mixture till half way into popsicle molds. 6. Fill till top of the mold with banana or blueberry yogurt mixture, depending on what you used to half fill. 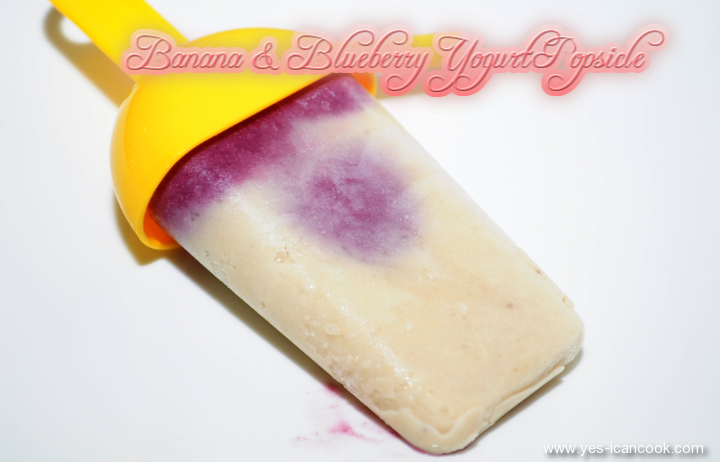 If banana was added first, add blueberry next. 7. Using a skewer or a toothpick swirl the two flavors together. I was scared to do this thinking they would mix up. The popsicles I made without mixing had an outer flavor layer and the other flavor was inside. 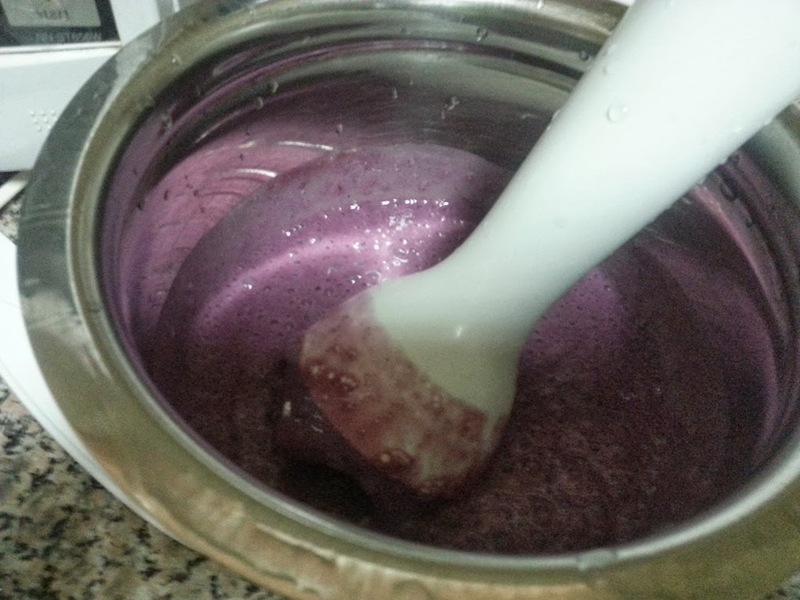 I will do proper swirling when I make them again and update the post with pictures. 8. Insert the stick and freeze for 8 hours or until completely frozen. 9. 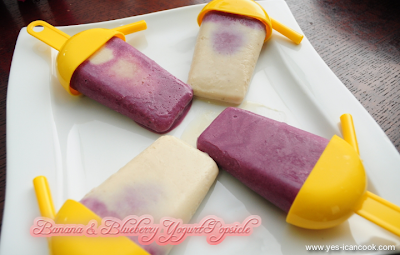 To serve, remove from freezer and dip molds in hot water for about 10 seconds to unmold. 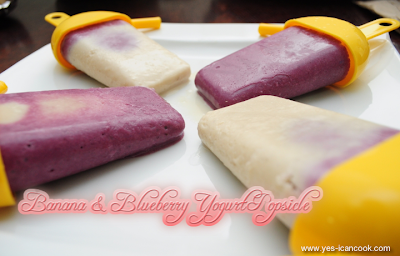 Enjoy Yogurt Banana and Blueberry popsicles. I would love to hear feedback and suggestions. Kindly feel free to write one. Recipe adapted from Divine Desserts. To make the blueberry juice, wash 1/2 cup blueberries and add them to a saucepan. Add 1/3 cup water and 1 teaspoon of sugar. Bring to a boil. Reduce flame and simmer for 6-8 minutes. When slightly cool blend with a hand mixer or appliance of choice, strain through a fine mesh and press with spoon to release all the juice. You can discard the pulp or use it for something else. Glad to join ur space. Thanks Priya. There is a home link on the side. Do you mean one at the bottom of the post? Thanks for suggesting. Thanks Subha. Easy to make and you will love them.